Scratch a liberal Democrat, find a tyrant seeking to influence every aspect of your life. 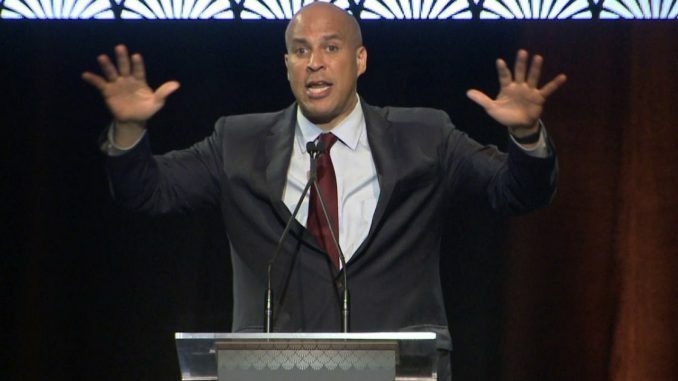 In an interview with the vegan magazine VegNews,2020 Democrat presidential hopeful Cory “Spartacus” Booker (also referred to as “Bald Obama“) declared that planet Earth “simply can’t sustain” people eating meat, despite the fact that it has done so for millennia. Although Booker claimed he really doesn’t want to tell people what to eat, he did say that “Americans need to be nudged into fake cheese because the planet cannot sustain the ‘environmental impact’ of the food industry,” the Washington Free Beacon reported. He also declared that while government shouldn’t dictate Americans’ diets, efforts should be made to offer alternatives he thinks consumers will like better. Booker is not alone in calling for transformations of major sectors of the U.S. economy. The 2020 Democratic presidential field has already called for the elimination of private health insurance, and to “reshape” capitalism. Booker, along with every other prominent 2020 liberal candidate, signed on to the Green New Deal, which calls for the “economic transformation” of the United States by transitioning to 100 percent renewable energy in just 10 years. Renewable energy currently accounts for just 17 percent of electricity generation. Sorry, Cory, but “fake cheese” and politicians like you interfering with my dietary choices doesn’t align with my spirit, either. And no, I’m NOT giving up my bacon, either. Would the U.S. government let Jesus cure cancer?